Andrew got a bike for Christmas and wants to ride it everyday. I wish our driveway wasn’t such a steep hill and was flat instead. He likes practicing his turns in the driveway under the carport. Sometimes he gets too fast and falls over. We need to buy him a new helmet (the one he’s wearing in the picture is a hand-me-down from a neighborhood girl – it was free!) and knee/elbow pads. 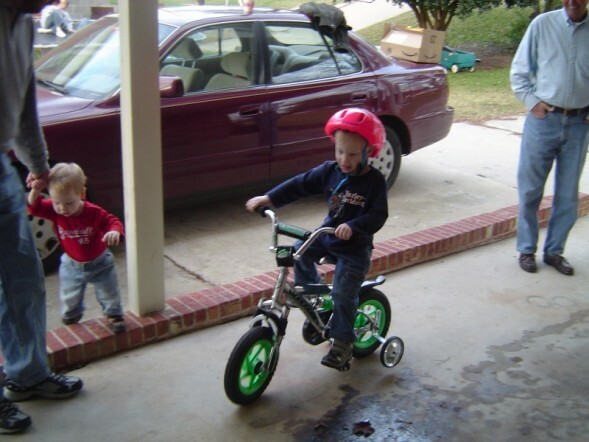 He’s showing off his steering and speed skills to his Pop in this picture.